Depending on the area of Greece, food may differ considerably as there is a tendency to use local products in the dishes. 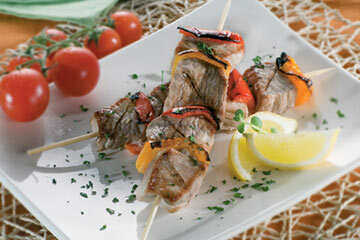 In coastal areas as well as on the islands, local tavernas and restaurants tend to offer fresh fish and seafood dishes. Such dishes include astakos (lobster), astakomakaronada (spaghetti with lobster), atherina (fried smelts), htapodi (grilled octopus, or occasionally sun – dried octopus), gavros (fried or marinated anchovy), kalamari (fried squid, or stuffed squid), barbounia (red mullets), mydia (mussels) and xifias (swordfish). In mainland Greece, on the other hand, it is accustomed that meat – based dishes be mostly served. Such dishes include giouvetsi (lamb or veal baked in a clay pot with kritharaki – orzo and tomatoes), hilopites pasta with chicken, kleftiko (which means “in the style of the Klephts”, slow – baked lamb, marinated in garlic and lemon juice, originally cooked in a pit oven), keftedakia (meatballs with or without tomato sauce), moussaka (oven – baked dish, with layers of minced meat and eggplant that are topped with a savoury custard), oven – baked lamb or chicken with potatoes (both “Sunday” dishes), and pork with celery and leeks. Apart from the above, many vegetarian dishes are also available in Greek cuisine. Some examples include anginares a la polita (artichokes with olive oil), arakas me anginares (oven – baked peas with artichokes), bamies (okra with tomato sauce), briam (a ratatouille of summer vegetables, such as eggplant, tomatoes, onions and potatoes), fasolakia (fresh green beans with tomato sauce), gigandes (oven – baked beans with tomato sauce) and lachanodolmades (cabbage rolls stuffed with rice and meat, served with avgolemono sauce – made of eggs and lemon). Soups are also widespread; some of the most famous are kotosoupa (chicken soup thickened with avgolemono), fasolada (a bean soup sometimes considered the national dish of Greece), magiritsa (traditional Easter soup made with lamb offal and thickened with avgolemono) and psarosoupa (fish soup made with various fish and vegetables).